“Wake up! 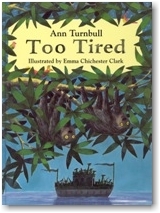 Wake up!” shout the toucans to the sloths. “The Ark is here. You must get aboard.” But the sloths are too tired to move, and the water is rising fast. Will Noah and the animals rescue them in time?